Olga is a fashion entrepreneur, helping women choose their wardrobe at an affordable price. She runs a successful eBay store – Nothing to Wear for her fashion collections (this is a reincarnation of Rich and Fabulous store that Olga ran for a while). She was in New York to attend a fashion conference and I was able to catch up with her and chat about her business, fashion and tips she has in these areas. Olga has also recently started her own fashion blog that you should definitely check out for latest ideas and tips on fashion. After all, she knows what she’s talking about! 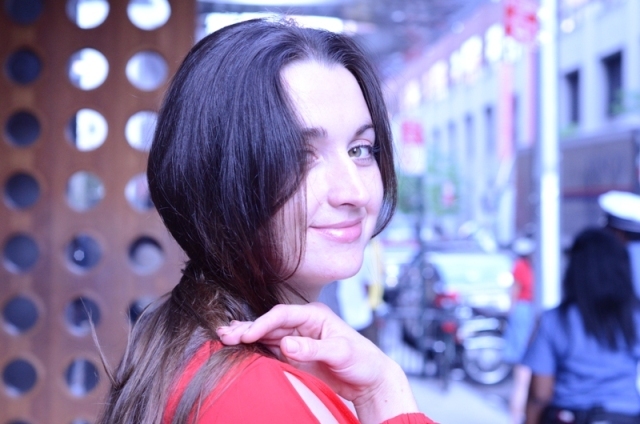 Olga: I am originally from Russia and I moved here when I finished college. I have a major in business. Here I worked in few different fields, from bartending to personal trainer! But fashion is something that always interested me. I always liked to wear nice clothes but I never considered it as a career until recently. Sidney: When did you come to New York? Sidney: How do you like the fashion world as compared to the other jobs that you’ve had? Olga: I like it much better because it is something I really enjoy doing. Plus, I really enjoy working for myself so I can set my own hours and terms. I feel like everything I do is going to pay off. I know this is something for me – I like the freedom of making my own hours. Sidney: Did you own any businesses before getting in the fashion industry? Olga: No, but I have a degree in business. I was planning to get a regular 9-5 job working for someone else, but it didn’t work out quite as well, so I decided to try something different. Sidney: Do you have any modeling experience personally? Olga: I do have some modeling experience but it was mostly for fun. I participated in a few events and shows and few photo-shoots. I was also in a TV commercial but I never considered it as a job. Sidney: How did you get started with the idea to have a fashion shop on eBay? Olga: It started just as everyone else – just selling my own things. I’ve got way too many clothes and I love shopping! So I decided to sell something and buy something new. I watched this TV Show House of Consignment about Chicago online consignment store and I found it very inspiring that you can actually make a living off of it. I decided to give it a try and so far it’s been fun. Sidney: Do you drop ship or do you personally pick everything? Olga: I personally pick everything on my store. Sidney: Tell me one thing that you like about the fashion industry the most. Olga: I like that it’s a great way to express yourself and show your creativity and vision. It just makes you feel good, as someone said “Fashion is Wearable Art” and I agree with it. It makes you feel happy. It’s a very positive and beautiful industry. Sidney: It must be very competitive though? Olga: Yes, it is indeed very competitive! Sidney: Where do you usually find your customers? Olga: This is one of the reasons I started on eBay and not on my own website because eBay already has a customer base. Millions of people already shop on eBay so you don’t have to work that hard to try to get people to your store. There are also lots of people selling on eBay so you have to stand out. Sidney: Are you active on social media? Olga: I keep my Facebook page up to date and I am also active on Instagram. Sidney: If you have to pick one thing that makes you special among so many sellers on eBay, what would you pick? 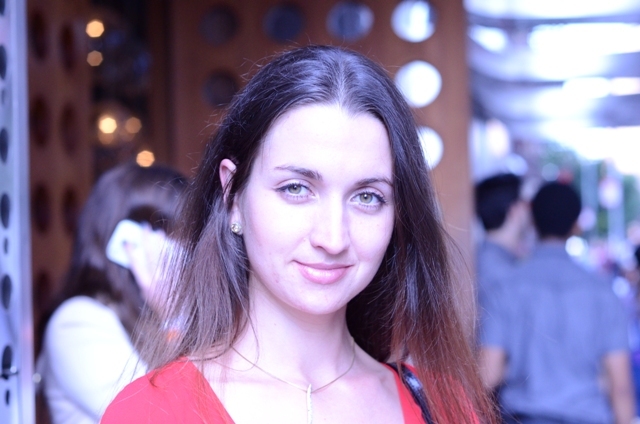 Olga: I try to provide the best customer service and I am top rated at everything I do. I also sell designer clothes for an affordable price and it isn’t easy to find. Sidney: How and where do you personally shop? Olga: I really like designer clothes but I am also a very savvy shopper. July is a great month to hunt for sales and bargains! I love to stock up on some unique items. I also have a very specific taste, so I know what I like and don’t like. That’s why I really like to go shopping by myself and not with a group of friends! Sidney: How would you describe your fashion sense? Olga: It’s trendy. I try to stay up to date with all the latest fashion trends but I also like to make it personal and unique. I would never buy something because something is in style right now and everybody else is wearing it. I like to have my own twist on these and make trends personal. Sidney: Any special pieces of jewelry you own? Olga: I like both real and fashion jewelry. I like it to be something special. My favorite piece is a vintage necklace that my boyfriend got for me. I really like vintage jewelry because there’s always an intriguing story behind it. When he got me this piece, I did some research about it and found out that it was made in 1920s, so it’s been out for a while. It still looks really beautiful – they used to make some really good pieces back then. I always wonder what occasion it was made for. Sidney: You’ve been in Russia and the US. How would you compare the fashion sense of the two countries? Olga: I think here people are a little bit more casual. I live in Virginia beach so I see most people in flip-flops and shorts all the time. Even in nice restaurants this is the case. I even went to see a play and people were in jeans and flip-flops. In Russia people really like to dress up. If you go the grocery store it feels like you’re in a fashion shop or something! Everyone wears heels and makeup. People really like to show off and dress up. Sidney: What do you think about New York in general? 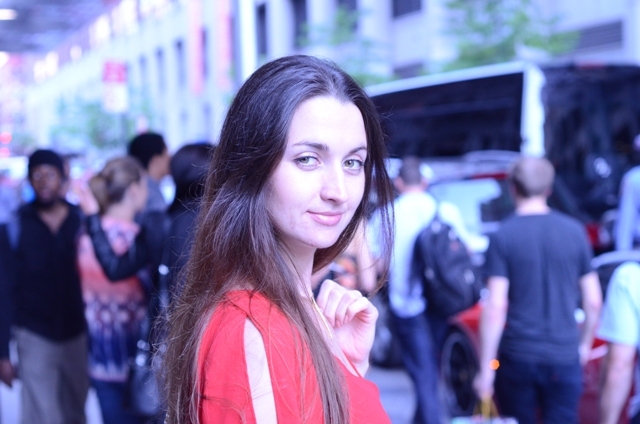 Olga: I love New York. I feel like home here – it’s one of my favorite cities. I visit here more than any other city. I know a lot of people don’t like it because it is busy and crowded but it doesn’t bother me at all. I love big cities. Sidney: You’ve been in the fashion industry for a while now. Any advice to people coming into the industry who are new? Olga: Do what you love. There was great advice from Oprah Winfrey who said “First find what you love, then figure out a way to make money from it”. I’d say find something you really like doing and then put all your passion and time into it and it will work. It never hurts to try. Even if it doesn’t work out, you can do something else but at least you won’t regret for the rest of your life that you didn’t try something. Check out Olga’s Facebook page and her shop.